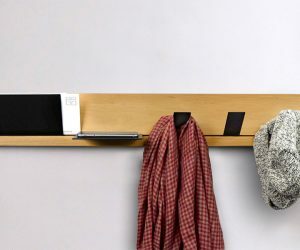 Simple, clean, and versatile, the Keep Track Coat Hook is a coat rack and shelving system proudly made in Portland, Oregon. Configure Keep Track to fit your distinct needs by sliding the metal pieces into and along a track of solid alder wood. The set come with two shelves and three hooks to make keeping track of your daily items almost effortless. 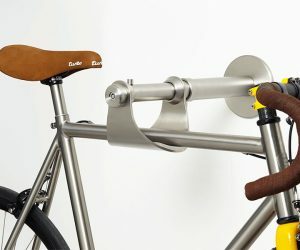 An Italian designed and made wall mount which may jut be the cleverest of its kind, Bike Safe blends beauty and practicality, perfectly. Hang any type of bike with any kind of frame, safely and neatly, thanks to the mount’s telescopic arm with a titling base which even has its very own in-built locking mechanism. Stylish simplicity to ensure you bicycle stays standing, meet the beautiful BikeBlock. 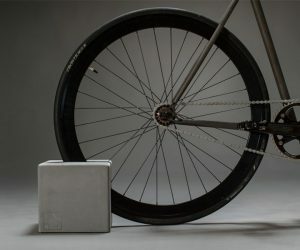 The cubic 18kg design is crafted from concrete with a slot carved out to fit tires from 26 inches to 28 inches by clamping them in position. The hefty weigh of the block means there’s zero danger of your ride toppling over, while the leather layer at the bottom means it’s safe to store on the high-end floor of your home. 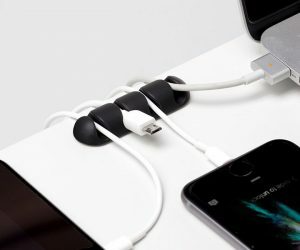 Keep your cables exactly where you want them with the clever Bluelounge CableDrop Multi. Easily fix to desk, wall, or PC thanks to a self-adhesive backing to ensure up to four wires at a time never go awol. There are even different sized channels for a looser or tighter fit — depending on how often you move the wires — all available in a range of vibrant hues. 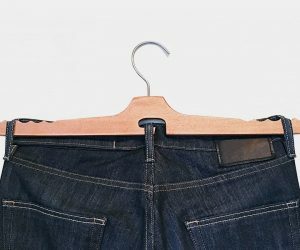 Hang your denim the right right way, free of creases and wrinkles thanks to the clever Jean Hanger, which also acts as a fine drying device too. Designed to fit on all jeans or pants with regular belt loops, it’s crafted from attractive beech wood. Invest in a few, and then there more excuses to chuck your clothing on the floor or back of the chair. Made in the USA, with the highest level of eco-consciousness, Re.Bin promotes sustainability through functional, innovative design, making eco-friendly living simple, intuitive, and the best choice for everyone. 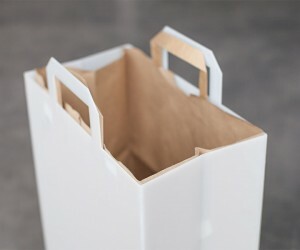 Tailor-made to fit smaller, urban living spaces, Re.Bin is a sleek and elegant recycling bin that is designed to use paper grocery bags as liners. Made from 100% recycled and recyclable plastic, this sustainable bin blends seamlessly with your interior decor, so your commitment to the environment won’t hinder your style.